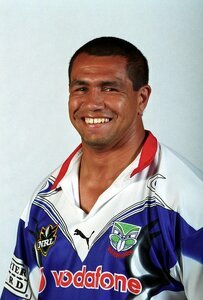 17-year-old schoolboy sensation made his first grade debut with the Steelers in 1990. Strong and fast with a great kicking game, Simon represented City Firsts in 1991-92 and was selected for the NSW side in the latter year. Despite a confident display in a match that the Blues won, Simon was dropped to make way for the return of Ricky Stuart from injury. His form wavered late in the season and his place was taken by Mick Neil but he made his way back into the Steelers' first grade team in time for the semi-finals. 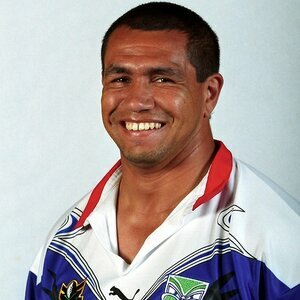 A cut foot (incredibly, in an after-match shower accident) limited his appearances in the 1993 season but he was back among the club's best players in 1994. 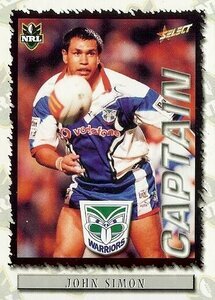 The following year he looked set to leave I’warra on a massive $300,000 contract until the advent of Super League seemed to pale that amount into insignificance. 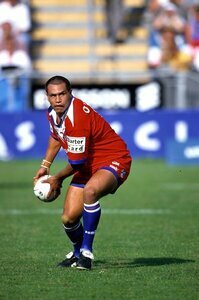 After a season with Easts, where he could not dislodge Adrian Lam at halfback, he was cleared by the club to move to P’matta. After representing Country and kicking a field-goal in NSW’s 15-14 win over Queensland in Melbourne that secured the series, he represented Australia against Rest of the World during the divided 1997 season. 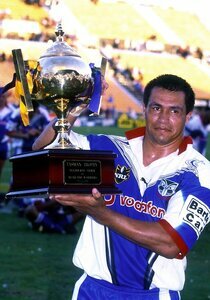 However, his apparent lack of fitness found him out of favour with coach Brian Smith and midway through the 1999 season he gained another release to play for Auckland (he was named captain in his second match with the club). After two seasons with the Warriors, Simon moved to the W’Tigers where, despite some good performances for the club, he announced his retirement before the end of the season citing a lack of enthusiasm.